A clay handprint impression from a preschooler is always a welcome gift for Father’s Day, Mother’s Day or any other occasion. This recipe is enough to make about three handprints. 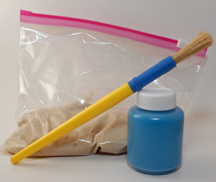 What You Need: 3/4 cup salt, 2 cups flour, 3/4 cup water, 1/2 teaspoon alum powder (alum is a preservative; only use it if you want the dough to last a long time AND you know your kids won’t eat the dough), mixing supplies, paint, paintbrush, pointy object (paper clip, toothpick, etc.) to write name and date. How You Make It: Mix dry ingredients in bowl, add water gradually and knead dough. Form into ball, flatten to about 1/2″ to 3/4″ thick and even out edges using your hands or a plastic knife. 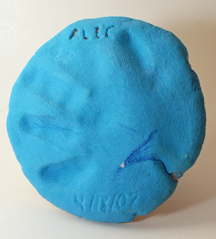 Child presses hand, with fingers apart, into clay. Adult can etch name and date with pointy object, or paint it on later. Let dry (at least overnight) and paint. “We tried it” tip: We tried baking this clay, but after an hour at 300 degrees it was still soft on the bottom. It hardened up after a few days. Also, if the dough crumbles, add a little more water. Additional resource: For more ideas for making things with baby or child footprints and handprints, including poems and quotes, visit www.babyfootprints.info. This entry was posted on Monday, May 28th, 2007 at 3:38 pm	and is filed under classic crafts, Father's Day, Mother's Day crafts. You can follow any responses to this entry through the RSS 2.0 feed. You can leave a response, or trackback from your own site. Where do you find alum powder?? I can’t find it anywhere?? Alum, also sold as aluminum sulfate or granulated alum, is also used in pickling so it might be in the canning aisle, or check health food-type stores. However, that’s a hassle: Many people substitute cream of tartar in play dough with great results. do you mix the paint in the actual dough or can the kids paint it later on? Kids should paint onto the dough after it has dried. If you’d like colored dough, mix in food coloring rather than paint. Have fun! Which type of flour? All purpose or self-rising? I’m assuming all-purpose. I’m hoping to make one of these for my husband. This is his first Father’s Day. Thanks for the instructions. Approximately how many handprints can you make with this recipe? The recipe should make enough for at least one child-sized hand. I made this one when my son was 2 years old, and I had enough to make two because his hands were small. If you’re making it for more than one child, or for a classroom setting, you can multiply the recipe. Thanks! I want to make a memorial kind of hand and foot print of my son when he turns 1 yr old. Is this clay long lasting? Last till years? In my experience, it lasts for many years. However, if you’re looking for something that will last for generations you might want to see about top-quality commercial handprint kits. There are some tips on my other site, http://www.babyfootprints.info. Have fun! I have seen four recipes excluding the alum. Do I need alum. What does it do. Alum is a preservative, and thus makes the playdough last longer. If you want to make a batch and store it for awhile, or reuse it over time, the alum helps it “hold up.” But if you are going to use the dough right away, you can leave it out. If you think your children might eat the playdough, you should probably omit the alum, because eating a lot of it could make them sick. Does it matter the temperature in the house while “drying”? Just wondering if they need to be placed in a cool, dry place, out in the open, or if putting them in the garage will matter? Do you need to put the dough on wax paper?